Can't find something you're looking for? Just ask, and we'll let you know if we have it or can get it. Donnelly/Colt Progressive Resources is a family-owned and operated mailorder business that has been designing and distributing union-made progressive materials promoting peace, social and environmental justice and human rights since 1975. We also offer a full range of custom printing services, prompt, inexpensive, quality union printing. Call (860) 455-9621 or email us at info@ donnellycolt.com. You can also Text us at 860 428-4867. Since 2009 we generate our electricity from solar photovoltaic panels that power our home and business. 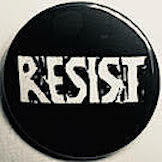 We custom print buttons, stickers, posters, yard signs, banners for you to promote your cause, organization, event, movement, business in your neighborhood, community, city, state or at national events. We can custom print buttons, screen printed vinyl stickers, or paper labels – union made – on a 2 day or 1 day rush, if needed. Twenty other products can also be custom printed (click on "Custom Printing" yellow tab above). 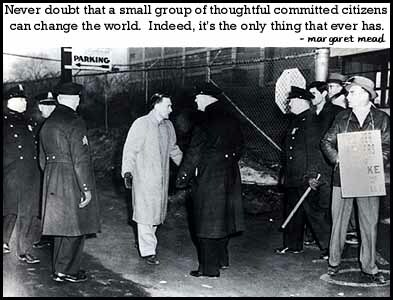 "Never doubt that a small group of thoughtful committed citizens can change the world. Indeed, it's the only thing that ever has." Margaret Mead Quote (Donnelly/Colt ©1995). 11"x17". 67 pound vellum stock. In her own words, she was a "Black, lesbian, mother, warrior poet" as well as an acivist, teacher, cancer survivor, author of 17 books of prose and poetry. Audre Lorde is still giving strength, guidance, and inspiration over 2 decades since her passing. (Syracuse Cultural Workers, 1994) 23"x23". Poster: Hope Has Two Beautiful Daughters; their names are anger and courage. "Hope has two beautiful daughters; their names are Anger and Courage. Poster: Together We Can Do It! Button: "Darkness cannot drive out darkness: only light can do that. 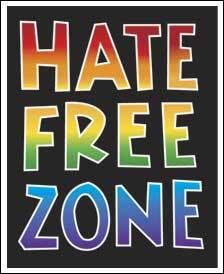 Hate cannot drive out hate: only love can do that." - Dr. Martin Luther King, Jr. Inspired by the Greenpeace banner drop from a crane near the White House, Washington, D.C. on January 26, 2017. Here's what it looked like. 9 hand-batiked panels, each measuring 11" wide by 9" long, made of 100% rayon, sewn together on a cord. Each banner is an individually made art piece, not printed by machines. The designer, artist Amara Wahaba Karuna, works for fair trade relations with small family shops where each banner is batiked, hemmed and sewn onto the cord. The vibrant colors are made using permanent dyes. This vibrantly beautiful, brightly colored banner is over 10 feet long. "Peace" is written in 7 languages: English, Arabic, Chinese, Sansrit, Russian, Latin and Hebrew. Ideal for display outdoors or indoors, at home, on holiday, at events, vigils, demonstrations, services. 13 oz. Cobalt Blue Glass Mug. A silkscreened imprint on one side says "Peace and Justice" with a graphic of cranes flying, a symbol of peace. The other side carries a Margaret Mead quote "Never doubt that a small group of thoughtful committed citizens can change the world, indeed it's the only thing that ever has." Union made in the U.S.A. and dishwasher safe, it's a perfect gift for the struggling activist, the part-time cytivist, the engaged citizen, the retired activist, or the radical, progressive friend, colleague, teacher, mentor or partner who drinks coffee, tea or any other beverage. As a gift, you can fill it with some buttons and stickers, too! • We pack it in a 4" x 4" x 4" corrugated cardboard box in a larger, padded box with any other items you order at the same time. Art by Amy Bartell • 2010 • 8" x 10" • 80 pound matte finish photo stock. 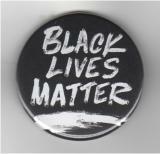 Bumpersticker: "The moral arc of the universe is long, but it bends toward justice." --Martin Luther King Jr.
One free sticker with every order IF you ask for one in the Ordering Instructions field. "You Are The Spark That Started Our Freedom Movement. Thank You Sister Rosa Parks." Text is from the song "Thank You Sister Rosa" by the Neville Brothers (1988) • Donnelly/Colt, 1990 • 11" x 17", union printed on recycled paper. Photograph of Rosa Parks taken in 1956. Rosa Parks initiated the Montgomery Bus Boycott when she refused to move tio the back of a city bus on December 1, 1955. The boycott lasted more than one year, , ultimately changing the discriminatory law that required black bus riders to move to the back of the bus if a white rider wanted their seat. 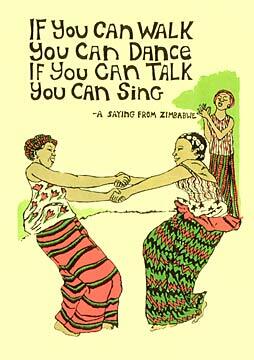 "If You Can Walk You Can Dance / If You Can Talk You Can Sing" A saying from Zimbabwe (Burning Spear Publications). Printed on heavy (14 point) ivory poster stock, 11"x17"
"Black Lives Matter:" became a rallying cry which echoed across the country in 2014 in the aftermath of the police killings of Eric Garner (Staten Island, N.Y.) and Michael Brown (Ferguson, MO) and then the lack of accountability of the U.S. judicial system. 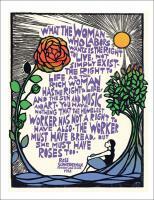 Rose Schneiderman, pioneering labor organizer and feminist, coined the title phrase. It was later associated with the important and successful Lawrence, Mass. textile strike of 1912, and made widely popular through the James Oppenheim song. 1.5" Button • 2016 • The international "No" symbol, a red circle & slash over the word "Trump" says it all, and is understood in many languages. Essential to wear when you travel outside of the U.S., to let people in other countries know you don't support Trump. 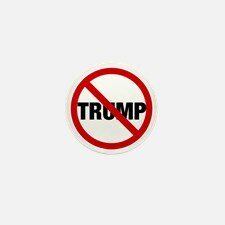 Also thisis just as important to wear here in the U.S., so others know they're not alone in their disapproval of this petulant, self-obsessed tyrant. You can order these in larger quntities. Use the Cistom Button Printing prucing for quantities of 250 for $140 ; 500 for $265; 1,000 for $380. UPS Shippig is additional on the higher quantities. New Yok street artist Eric Drooker's scratchboard illustration, dramatically printed in opaque white on jet black T-shirt, has an intense graphic power and visual impact. Our consistent best seller since 1990. 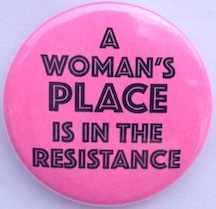 Also available as a bumpersticker, fridge magnet and now a magnet-backed button to wear on clothing (without a pin). Each of the seven 4" x 5” WELCOME panels contains a beautiful letter filled-in with graphics from a previously published Syracuse Cultural Workers product, and a progressive saying which begins with the panel’s letter. This inspirational poster will welcome people to your home, office, place of worship, classroom or any other location you want to have awarm, inviting "Welcome message on display. It can also be used as a booklet/gift for welcoming rituals. Folded, it comes with a strng through a hole at the top to hang it. Workers union, on strike in West Haven, CT in 1951. • We now have a Quick-Order Section without images so that you can find what you're looking for more easily if you have a slow Internet connection. • We've put together a collection of our favorite progressive web sites. Be sure to check them out, and let us know if there are any great sites we're missing! • Customer Comments we've received over the years. To subscribe to our occasional (6 times a year) email to receive news about new and featured products and special deals, enter your email address below and click Subscribe. To unsubscribe, enter your email address below and click "unsubscribe". Copyright ©1975-2018. Donnelly/Colt. All rights reserved. Actual sizes and colors of products may vary. Design and development by Satori.